I asked him to have a seat and finish the giant bowl of cereal he’d poured for himself, and then I promised him I would be at the school on time for his annual appointment with the eye doctor. Like many things about Jack, his eyes are peculiar; as a toddler he was diagnosed with Horner’s Syndrome, where one pupil is almost always dilated larger than the other. Harmless, but, well, weird. In first grade his teacher, the lovely Mrs. C., noted that he looks down at the paper with his head tilted to the right side and reads from the outside corner of his eye. Once she pointed it out, I began to notice how often he slants his head that way; whether choosing a cookie from a plate or playing the Wii, Jack tends to position himself so he peers from his right eye. We started taking him to the optometrist, and although Jack had a hard time staying regulated and still for the exam, he managed—in between shrieks—to spit back a few letters from the eye chart. We figured the head-tilting was just another one of his quirks, no different from the way he rolls pancakes between his fingers and clears his throat loudly three dozen times a day. At nine, his one eye continues to have a larger black center than his other, and he still reads from the corner of his right eyeball. But, really, the most notable thing about his vision this year is he’s started to make regular eye contact, to connect his gaze with ours when he’s speaking. We realized this year that Joey needed glasses, so on Wednesday I figured it was possible we’d leave this office visit with a prescription for lenses that I would have to remind Jack ninety million times to find, clean, and wear like I do his older brother. This year, he was calmer as we walked into the optometrist’s busy reception area. Although stimming quite a bit, he happily climbed into the seat and started to ask a zillion questions about the blood pressure band, whether there are scorpions in New Hampshire, how long it takes to drive to Oklahoma. Once the doctor came in he sat up straighter and placed the plastic shield over his left eye, and began to read the chart in his robotic voice; A V P D E are there black widow spiders in the woods S T R X have you ever seen a South Dakota license plate. Wow, I thought to myself. What a difference a year makes. “Jack, just use your left eye and read the letters,” the doctor encouraged him. “I CANNOT! I can’t see them. Please. I need my eye. My OTHER eye,” he begged. I kept my own eyes firmly locked on the screen as the doctor enlarged the size of the capital “A” until it was several inches high, and with each increase my stomach sank lower and lower. I covered my mouth with my hand. “We won’t know for sure until he sees a pediatric specialist, but at best he’s legally blind in his left eye,” the kind doctor said softly. He went on to explain that, basically an exaggerated version of something called a lazy eye, Jack’s right eye has been doing all the work for the left, until it grew weaker and weaker and lost most of its vision. I had a lazy eye myself as a little girl, and I remember wearing an eye patch in kindergarten. To this day I can call to mind the sensation of tears puddling in the bottom of the flesh-colored patch as I begged my mother to take it off before school. I wore it for a few months, and it worked. The eye was strengthened. I struggled to explain. He doesn’t bump into things. He never drops a book or spill his milk or so much as knocks a fork off the table when he stims at dinner. He was the first in our house to master riding a bike without training wheels and when you look at him, his eyes track together; two blue orbs that light up my heart when they occasionally meet mine. Adapt, I thought bitterly. Yes, Jack is no stranger to adapting. Every single day my son wakes up and adapts his rigid mind to a world full of fire drills and barking dogs and standardized testing, where people picture Tuesday in tones of black and white and grey, while his weeks explode with color. A world that demands flexibility and oh yes you will try that chicken pot pie. With the phrase legally blind legally blind legally blind bouncing around my brain, I struggled to keep my composure as we left the office. Once we were in the car I quickly called Joe, while Jack shouted from the third row. A tremendous wave of guilt washed over me and the words legally blind began to weave in and out with the phrase my fault my fault my fault. This is my fault. Why didn’t I take him more often than once a year? Why didn’t I push harder to understand the head-tilting? And I know the condition of legally blind isn’t really all that big a deal; with an acuity of 20/1600, I myself am considered legally blind. As a few of my friends pointed out, many, many people walk around with poor vision in both eyes, and how corrective eyewear and laser surgery and contact lenses have come a long way. But sitting in the darkened Bertucci’s fifteen minutes, I considered how once again, I was foiled by my own message of always understand the behavior has meaning. All this time, since he was a smaller version of himself wearing his favorite striped blue shirt to first grade, Jack’s been turning his head to peer out of the corner of his right eye because his left was slowly clouding, blurring, darkening. I mean, how many essays and chapters and articles have I written about autism with the phrase Jack sees the world through a different lens? Little did I know how different that lens actually is; for years he’s been learning to read and ride a bike and download ITunes through a singular view, and I never knew it. As we walked out of the mall into the bright afternoon sunlight, Jack squeezed my arm and pointed. “Look. Tennessee. Over there on the Dodge Neon.” I looked away, wiped a tear from my own eye, and in an unsteady voice answered him yes I see Jack-a-boo I see it. I don’t know if Jack is into pirates but they now sell fabulous pirate patches that slide over glasses to strengthen the opposite eye. My nephew has one. I believe there is a website. Hope this helps. Thinking of you guys! Oh, Martha put what my heart was feeling for you, beautifully, Carrie. We adapt our head knowledge of “always understand the behavior has meaning” as our children’s needs adapt. You are an amazing mom! You will help him navigate this new adaptation beautifully. Give yourself the space to breathe while you do. I agree with Martha. 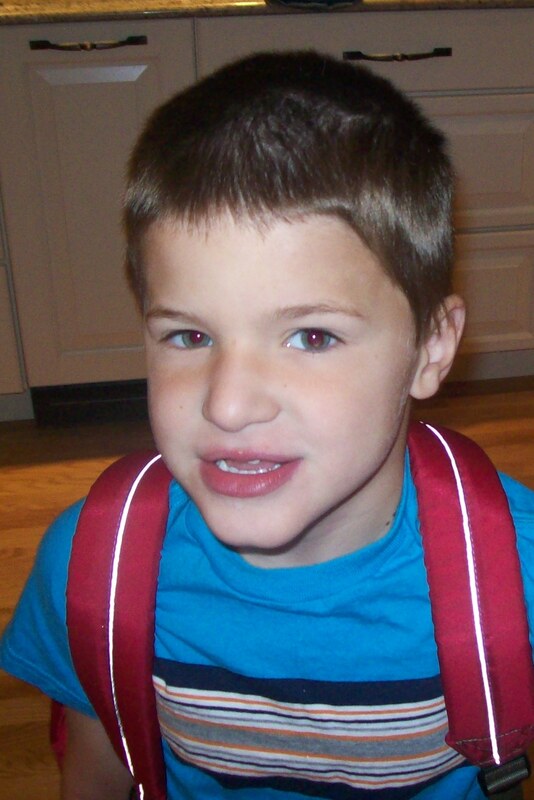 It is hard enough to realize that a child like Joey needs glasses, compound that with Jack’s communication issues, and it becomes nearly impossible, not just for the parents, but for all medical and educational professionals that have been working with him. Give yourself some slack!